Japan’s culture is one of sea salt. 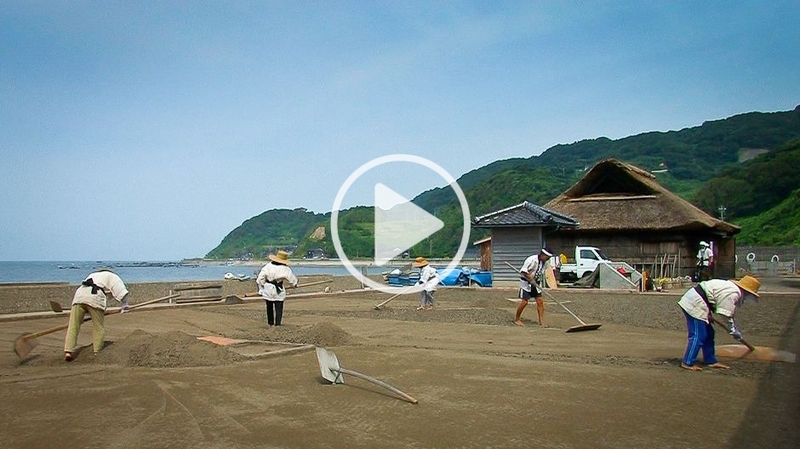 For centuries, salt production has been an important activity throughout Japan and coastal communities have developed sophisticated techniques for producing this vital mineral from seawater. One of the oldest records of salt making appears in the eighth-century chronicles of Kojiki and Nihon shoki, Japan’s oldest mythological and historical writings. There it is said that when the ship that brought water for the imperial table became too old to be used, it was turned into firewood used to boil thick brine down to salt that was then given away to the provinces. Snapshots of salt making scenes also appear in court poetry and in noh theatre. Typically, they depict the lonesomeness and isolation of salt shores. Outside the world of literature, the importance of salt is reflected in the presence of salt routes, place names associated with salt and shrines where salt gods are worshipped. Salt is used as a cleansing and purifying agent in a variety of ritual contexts. The small artisanal salt farms still found today on the shores of Noto Peninsula in Ishikawa Prefecture stand as a symbol of the co-evolution of human societies and their environment in the context of the extraction and use of salt as a fundamental marine resource. Salt production in Noto dates back at least as far as the fifth century, when small ceramic pots were used to boil the seawater. Later, these techniques fell into oblivion, as a new salt manufacturing method, known as the agehama style, started to develop sometime around the eighth century. The new method consisted of two separate stages — water was first drawn from the sea and spread on banked sand terraces to evaporate and the resulting brine was then boiled down over a specially constructed kiln. 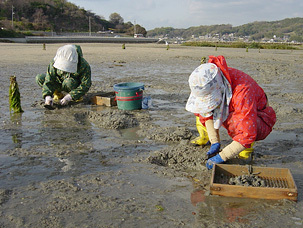 Even after technological advances led to the introduction of a more efficient, labour-saving production method elsewhere in Japan, older agehama techniques live on in the Noto Peninsula. Their survival was the result of a locally-specific combination of natural environmental characteristics and socio-economic factors. The peninsula’s rocky shoreline, with minimal tidal flows, and its climate (characterized by high humidity and limited sunshine) were not suitable for the new method that relied on the flooding of terraces by natural tidal variations. Despite the not so favourable natural conditions, the tax policies of the Edo period’s (1603-1868) ruling local authorities, the Kaga Clan, played a crucial role in shaping the peninsula’s identity as a salt producing area. During the Edo period, rice was the basis of the taxation system, but cultivable land was scarce in Noto. Under the Kaga Clan’s ‘rice for salt’ system, farmers who did not own enough land to allow them to pay their rice taxes and secure the food necessary for their subsistence borrowed rice from the government, paying for it in salt at a fixed rate. The clan held a monopoly on the salt trade, with profits from sales being used to pay up to a quarter of the daimyo’s (territorial lord) travels to the capital Edo (now Tokyo) as part of the system of alternate attendance established by the Edo shogunate (feudal military dictatorship). The rice for salt system was instrumental in making salt production one of the most important occupations of people along the coasts of Noto, while restricting the salt workers’ freedom for social or geographical mobility. Thus, the salt terraces that once lined the peninsula’s shores — which can still be seen in photographs from the 1940s — emerged as veritable ‘cultural landscapes’. These reflected not only the specific constraints and opportunities of the natural environment, but also a unique socio-economic context that fused the local people’s dependence on natural resources with their control by the elites. In 1868, the Meiji Restoration marked the end of feudalism and launched an era of modernization influenced by western models. Overall social and economic restructuring, the abolition of the clan monopoly on salt, and the introduction of new policies and technologies led to a sharp decline in traditional salt production in Noto Peninsula. With new employment opportunities offering different life choices, former salt makers moved to other industries and salt terraces disappeared from the landscape. When a new wave of salt industry modernization measures — introduced by the central government in 1958 — threatened to wipe out traditional production, the local administration of Suzu City in Ishikawa Prefecture provided funding to the families still practising this cultural tradition. Eventually, only one family remained. In recognition of its value, both culturally and as a tourism resource, agehama-style salt making was designated an intangible folk cultural asset of Ishikawa Prefecture in 1992 and a national intangible folk cultural asset by the Culture Agency in 2008, stimulating new initiatives to revive traditional techniques in recent years. Agehama-style salt making, as practiced today in Noto, evokes the shadows of the salt farms as places of intense labour and the working and social conditions of the people employed in salt making. However, it is not only in the reconstruction of the past that its value resides, but also in the transmission of the traditional knowledge and practices that are vital to its survival. On a first level, such traditional knowledge encompasses the architectural aspects, equipment and ways of production associated with salt making. While many of the tools and materials used have undergone little change for centuries, others have been replaced with new ones in the quest for comfort and efficiency. The artisanal knowledge needed to craft these tools and build ovens using traditional techniques is increasingly in danger of being lost. Agehama-style salt makers are also custodians of a wealth of experiential and traditional knowledge of their natural environment, which includes elements of integrated management of land and marine ecosystems. Such knowledge embraces various dimensions, from the salt makers’ renowned ability to predict the weather by reading cloud patterns and sea currents, to their empirical knowledge of the state and change of marine ecosystems and resources. Although salt makers now tend to use cheap wood waste from construction sites as fuel, in the past, salt production practices were closely connected with inland regions through the supply of fuel wood, with salt makers owning and managing forest areas to ensure a sustainable wood supply. The two-stage process of agehama salt making reflects this interconnectedness in its effort to reduce fuel consumption by relying on human and natural forces to produce a highly saturated brine solution prior to boiling. Such elements of sustainable land and resource use at the landscape level make salt farms more than just salt yielding sites. They have the potential of contributing to new approaches to resource conservation and use, such as ‘satoumi’, a recently introduced concept designating socio-ecological production landscapes in coastal areas, which are managed for the ecosystem services they provide. The question that remains unanswered is how the knowledge associated with these unique cultural landscapes — which have developed as part of salt’s complex itinerary in the culture and history of Japan — can be integrated with scientific knowledge to develop models of resource use and management that maintain or enhance natural values in the landscape. Preserving Japan’s Sea Salt Making Tradition by Laura Cocora is licensed under a Creative Commons Attribution-NonCommercial-ShareAlike 3.0 Unported License. It is essential for our survival as a species that we continue to remember how to do things without the use of industry or heavy machinery. I completely concur with your cogent statement, Jorge. Beautiful story of traditional knowledge being handed down through family. Sure, knowledge is always good, yet attention and time are precious – and finite – resources. Would you rather have your kid’s attention and time spent on learning how to keep the tradition of mammoth hunting or on how to learn a computer such as the one you are using now? The answer to that one is easy. I think we can expect our kids to be able to learn more than one thing. Don’t you? Dear Provocator, With an estimated 9 billion people expected to populate our planet shortly, perhaps we need to update the old Native American saying “you cannot eat money” to “you cannot eat computers”. You cannot eat mammoths, either. They are extinct. Oooh, how provocative… Hey ‘Provocator’ – different strokes for different kids. And I hope yours have some skills that’ll help them procure food if ever things, as we know them today, change.